Brenda and Daisy spoke at length about what they would be doing that afternoon as they picked at breakfast and drank their coffee. The diner was full that morning but they were able to secure two spots in a booth right by a window and a small jukebox. “Its hard when they leave…but it all changed when I became a grandmother. I never thought I could love anyone so much…” She dabbed her eyes as tears welled up. “Whats wrong, Daisy?” Brenda took her hand. They both laughed and then Daisy looked up and smiled. It was David and his wife, along with Eddie and a younger girl, who Eddie introduced as Jennifer. The time flew on by as the memories came flowing towards them like a river of dreams, scenes and slow dances. Music was played from the jukebox – old songs chosen by Eddie and David. They spoke about the night before – the teachers, their fellow students. “I felt the same way…I am still trying to figure out where the time went…” Brenda said looking away and then looking at her watch. It was time. Daisy looked at her as she stood up and Brenda looked back and smiled, a sad smile of recognition that some scenes can never be replayed again – once the lines are recited and the curtain falls there is no going back. There are some plays, plots and stories – no matter how much one rehearses the gestures, lines and the steps that should be taken – nothing can adequately prepare one. We still find ourselves standing on the stage, spotlight on and an audience waiting in anticipation for the next line, the next scene…a cold sweat beneath the lights and the curtain begins to close but there is always another line to be recited, another word to be spoken…no amount of anticipation or rehearsal can prepare one for the adlibbed lines thrust upon them or the wrong performer reciting the lines. Brenda walked across the floor and put a quarter in the jukebox. Picked B17, smiled and turned away. She stood alone in the bathroom with the window locked shut – no escaping this time but this time she was not going to even try. 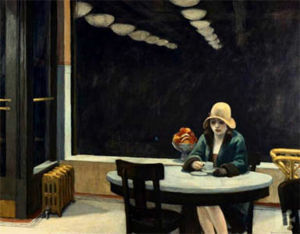 She washed her hands, adjusted her hair, walked out into the diner and sat down next to Daisy. They all smiled as the song ended – the song was the same song and possibly the same vinyl record from all those years ago. But the ending this time would not be an ending or an escape it would be a sort of homecoming or a continuation to what once was. “Yes I’ll remind the gang, love you.” She gave him a kiss. “It was so nice meeting you all and putting a face to the mythical names I have heard about all these years. You are all even more beautiful than I ever imagined.” With that she left. “She doesn’t like you too much.” He laughed. They all joined in. They finished breakfast which had turned into lunch and made plans to meet up that night at the reunion. Brenda had already made up her mind. Daisy gave her a hug and they both jumped into the car. “Here listen to this CD.” Daisy pushed it in the slot and a familiar piano began to play. They both laughed and then Brenda looked out the window as they passed the old familiar spots. The spot where a Carvel ice cream parlor once stood, a now vacant lot where there was once an arcade and they would order Egg Creams and play Asteroids and Space Invaders for hours. Actually the boys would play and the girls would sit and talk. Oh those talks, those friendships, those innocent times when life was in front of us and within our grasp. They drove past the school where the banner welcoming them back for their reunion was hanging on one end. The clouds were forming above and a wind was blowing. There was a crack of thunder and then a blustery wind and they were in front of Daisy’s old house. It did not look like it once did – it was totally redone. “Yeah, that’s kind of deep for me.” Daisy laughed. “And climb through the bathroom window.” They both laughed. The night went well – there were dances and there were toasts. Mostly toasts to things past, people past. When the last song was played Eddie walked Brenda home and they said goodbye at the door. She closed the door behind her and he walked away. The memories were past and the moments were now enshrined once again in the hall’s within our hearts and minds – we are given moments. We are given these moments and try to not forget to make the most of each second. We capture pictures, remember aromas and sing the songs – remember each word, each kiss and each hand held. When the time comes to think back or when the night falls too soon and the darkness overwhelms us – we remember as we choose to remember. I guess I was hoping for the romantic reunion.It so true,you just can’t go back.We each have our own memories of the same story.In high school I had a boyfriend that loved me deeply.I too jumped out the window.He now is very,very successful & married for almost 50 yrs.I am happy for him.